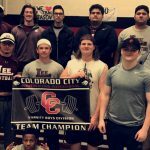 The Lee Rebel Boys Powerlifting Team took 1st place at Colorado City! Congratulations! Saturday, March 5, 2016 9:00 AM Place 1 Points 0 Meet Recap Midland Lee girls had a strong showing at the Division 1 Girls Regional Power Lifting meet in Ft. Stockton. Cassandra Corpus, in the 105 Weight Class placed 1st and broke the regional Dead Lift Record for the 105 Weight class at 275 Pounds.